Showing results for tags 'brayherd'. While I'm still quite fond of the Thunderscorn, I am taking on the challenge of building an army that includes the Marauding Brayherd battalion. I look forward to constructive conversation on how to make it happen. I am aware of the critiques leveled against this battalion. I share some of those concerns. It seems overpriced, especially compared to Desolating Beastherd and the God-specific battalions. It seems to functionally require the bulk of one's points to be dedicated to the battalion itself, leaving few points available for complimentary options the Beasts of Chaos list. Then again, it's the Brayherd battalion and I want to see if the Brayherd can create something among themselves. Here's hoping! So, the sole mechanic benefit of the Marauding Brayherd battalion is its +1 to charge rolls for ambushing units on the turn they ambush. As I read it, that means we must focus on how to best succeed at charges on the ambush, given the battalion's unit requirements and the Beasts of Chaos list. Yet, despite the latter's expansive potential via the Darkwalkers Greatfray, the former functionally limits us to Brayherd options. +1 to charge rolls for ambushing units reduces our need from a nine to successfully charge (presuming one's ambushers are placed as close to enemy units as legal) to an eight. That is a real, if admittedly modest, change. Further options to reduce the required number do not seem readily available. Re-rolling failed charge rolls seems to be our only means to enhance the battalion's "charge on the ambush" focus. An eight with a re-roll has a solid chance of success. I see two interesting options here: * Tuskgor Chariots. These are often overlooked within Beasts of Chaos conversations, as they are unassuming, if workable, options. However, an innate re-rollable eight on the charge, with a total on the charge of ten attacks per model, is pretty solid. The fact that Tuskgor Chariots can form units, rather than only attack as single models which each require their own respective activation, is also attractive. * Allherd Greatfray. The Command Trait here is what matters. Deploy the general via ambush, charge at an eight, re-roll via Command Point if necessary... then, if successful, give all other ambushers within 18" a re-roll on their own charges. Fortunately, this Greatfray does have additional utility, too. The overall Greatfray ability is also helpful given multiple ambushers, the Command Ability could potentially add some other Beasts of Chaos fun to a Brayherd-centric army, and the artefact helps maximize an ambushing general's lethality. Temper the above with an appreciation of the fact that ambush is not, by itself, a winning approach to strategy. This was the case even in earlier editions/games, when Kazrak was still around. A focus on ambushing as much as possible, simply for the sake of using the option, probably should not be the bulk of one's build concept. A solid core of one's army, here meaning its elite and/or larger units, should still deploy normally. Ambush a lot, even a whole lot, but I think the critical units (massive regiments of Bestigor, for instance) should probably deploy normally. This is because a canny opponent can influence the useful of ambushing units via their own initial deployment, unnecessarily introducing an additional variable into an already tricky process. Conceiving of ambush as an enhancing option is probably best, positioning ambushing forces to supplement massive regiments of elite troops. So, all this said, here's what I'm exploring as a competitive way forward for the Marauding Brayherd: ----- Allherd Greatfray from the Realm of Light (2000) Battalions Marauding Brayherd (180) Endless Spells Prismatic Palisades (30) Deployed Units Great Bray-Shaman (100) - Spell: Vicious Stranglethorns x30 Bestigors (300) x15 Centigors (240) x10 #1 Ungor Raiders (80) x10 #2 Ungor Raiders (80) x10 #3 Ungor Raiders (80) Ambushing Units Beastlord (90) - Command Trait: Dominator - Artefact: Blade of the Desecrator Great Bray-Shaman (100) - Spell: Tendrils of Atrophy - Artefact: Brayblast Trumpet x4 Tuskgor Chariots (240) x20 #1 Gors (160) - Paired Gor Blades x20 #2 Gors (160) - Paired Gor Blades x20 #3 Gors (160) - Paired Gor Blades ----- Deploy the Centigors and Bestigors within range of the deployed Great Bray-Shaman's "Infuse with Bestial Vigor" ability. This will ensure the Bestigors move at least 10"+d6 and the Centigors move at least 18"+d6. The Centigors can likely charge in the first turn, hopefully supplementing an ambushing unit, while the Bestigors can move forward to threaten the board from its center. Ungor Raiders can maneuver to hold backfield objectives, while one unit stays near the Herdstone with the deployed Great Bray-Shaman to fuel Primordial Call support. Ambushing units can be spread out a bit, as the 18" range of both the Dominator Command Trait and the Brayblast Trumpet Artefact of Power is fairly expansive. Charge with the Beastlord first, using a Command Point if necessary, to hopefully benefit from the Dominator Command Trait. Consider attacking a unit with lots of figures, to maximize the Beastlord's Blade of the Desecrator. It might even be possible to get kills from the Beastlord in the combat phase to make his innate Command Ability become available. If so, consider using it to make the (hopefully successful) charge of the Tuskgor Chariots result in potentially forty attacks that re-roll wounds (before factoring in the bonus from the Brayblast Trumpet). So, what do you think? Please share. I look forward to the conversation! Here's my painted Warherd army for which I have been using Mierce minis ( I work for Mierce and oversaw the creation of these awesome minis so I was dying to use them in the wild! ) 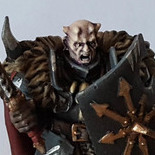 In AoS terms the list is Warherd Allegiance and contains (name on Mierce site in brackets) 1 doombull (general) (Qaano) 1 Doombull (Cqaa) 6 Bullgor (Sronax) 6 Bullgor (Sronax) 3 Bullgor (Sronax) Ghorgon (Tarvox) Ghorgon (Tarvox) Cygor (Druc) Cygor (Gorugg) I won 3 and lost 3 at the recent SCGT event in the UK. For what's considered to be a bottom tier army I was pretty pleased! The Bullgor can certainly catch ppl out with their long bomb charges! EVen after you go through what they do. The army is a ton of fun to use, is awesome at Duality of Death and can smash face. Though a lack of numbers and low armour can be your downfall in some scenraios/vs some armies. Just remember Warherd strong! (and roll those 4+s) Due to an impending house move (and expensive conveyancing fees to pay) the army is for sale. It contains the following (details from the Mierce site) ##druc, meat-hulk [resin] X fomoraic srónax monstrous infantry starter host [resin] X galagaak, raging tarvox [resin] (2) X gorugg, feral oghurüc [resin] X roaring srónax, srónax unit [resin] (2) X total: £595.13 X# I'm open to serious offers. I will ship via UPS (internationally) and Royal Mail special delivery (UK) only as both are tracked services. For an additional fee I can rebase onto Darklands bases and if you wish (for another fee) I can change the basing scheme completely, though this will take time. If you're interested feel free to DM me here or to mail me timfisher@mierce-miniatures.com - cheers! Heyo! I'm just looking for a "some what" competitive brayherd / warherd list and i thought you guys could help me out Thank you! Hi I'm running a goat posse 2000pts deep and was wondering if Brayherd alliegence or Grand Alliance Chaos was the better bet? I'm leaning toward Chaos with the Wildstalker battalion. This seems to give me enough bodies, some very useful buffs and Ambush with access to more toys. Is it worth giving up Herdstones and forgoing the Brayherd traits & warfare for? Could an all-Gor list work? 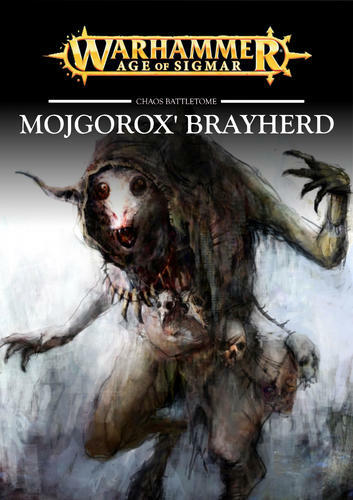 I thought I would share the direct download for you all to the Brayherd battle tome I have created. I printed a Hardback copy for myself as well as one spare for a prize giveaway at #RAW17. I hope you enjoy reading as much as I enjoyed building it. Cheers. As per the title, if anyone has a spare Gor lying around (or the bits needed to make one) I'm interested. Would be prepared to buy a few of them if selling a single one isn't worth your while. Thanks in advance. 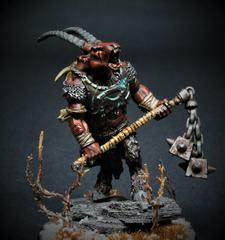 Inspired a bit by @HobbyHammers 'This is how I brayherd' blog, I started thinking about my old Beastmen army, as by the looks of things, I could probably make a pretty convincing AoS army with them. This inevitably led me to start thinking, what would I do to expand the Brayherd faction into a fully fleshed out and meaty faction. What would it take to get these guys status to be 'back' And I think, there's not actually a huge amount of work that needs to be done! So let's get the ball rolling. Bring back some units back under the Brayherd banner The Grand Alliance books split some units odd ways. But I think the oddest choice was to send the Centigors to the Monsters of Chaos section. They've got Gor in their name! Why aren't they with the rest of the Gor? I also think that Warhounds and Razorgors should be bought back into the fold as well, these can be the 'hunting pets' of the Brayherds (As much as you can tame and call a big huge slab of mutated pig a 'pet' anyway). I think all 3 of these units make thematic sense in the Brayherds, and don't really double up on anything else the faction has to offer. Bring back some Compendium Scrolls Malagor has a great little scroll in my opinion, that could easily be rebranded into something more generic. Call him a 'Crowfather' or something, maybe have him synergise with the more 'beasty' things like the Warhounds in the list. In a way, he becomes the Icebrow Hunter of the Brayherds. 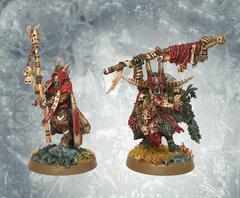 I also think that the Wargor Standard Bearer adds a good little synergy into the Brayherd army, which would be a shame to lose. Which not having a model, leads me onto point 3... A (few) new models Brayherd as a model range, is actually pretty good at the moment. Most of their stuff (barring one which I'll talk about in a moment) is pretty new and still looks good today. But just like any army, they could do with a few new model kits to fill the gaps around the edges. 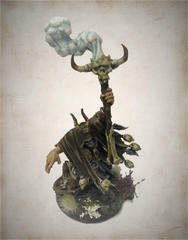 Obviously the aforementioned Wargor Standard Bearer would need a model, but there are a few other kits I think would have potential... First off, a Chariot kit. The tuskgor chariot is a pretty old model these days, and I think it has great potential to be revamped. There was always a bit of wishlisting about a combined Tuskgor/Razorgor Chariot kit, and I think it makes perfect sense! In a similar vein to the Stonehorn/Thundertusk kit, I think you could actually squeeze a lot of warscrolls from the one kit. You've got a Tuskgor Chariot, Razorgor Chariot, and then Character(s) on either variant. 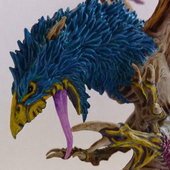 I'd definitely want to see a Beastlord screaming around on one. Maybe you can even squeeze in another new character and a Bray Shaman on one would be pretty cool also. The other thing I hope is that, if you build say a 'vanilla' variant, you might get a free Razorgor and character on foot. Talk about good value! You could probably stop there, but I think the other thing to consider would be to replace the aging Centigor kit. I don't actually mind the kit actually, having 5 painted and another 5 in a box. But they are old metal nowdays, and a good opportunity to replace them and give them another weapon option or two. At least a Great Weapon variant, but perhaps a bow variant also (Although, Drunken Centaurs firing bows and arrows might not work out so well). The last thing to consider, is whether or not there should be a special character to 'lead the faction'. I don't think it's totally necessary to do this for all factions. Perhaps Brayherds being a bit 'faceless' and 'goaless' gives good reason either way. 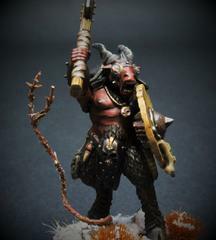 A good strong character could give them direction as to what they want to do in the mortal realms, but it may feel a bit too much like the 'Gordrakk' of Beastmen. And of course, a Battletome With new models, you'd want a new battletome. I think if they got the extra models, they have enough depth to have their own battletome without needing their Warherd pals on the side. 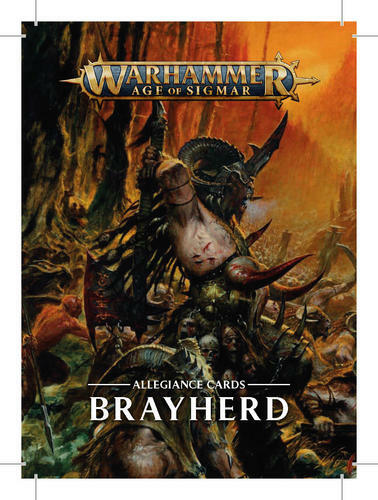 I think Brayherds will get Allegiance Abilities with GHB2, but of course a Battletome would add in much needed Warscroll Battalions. With the extra units added in, I think you could create some pretty interesting battalions. I think a Beast pack type one with a Crowfather, Warhounds and Razorgors would be cool. With all the chariots flying around, a Chariot based one (perhaps with Centigors as well) would be pretty sweet. Tons of stuff. Thinking about the above... gets me really excited sometimes (and perhaps sets myself up for disappointment). But, it's really interesting to see how close some factions are to being fleshed out. Sometimes all you need to do is shift a few things into the right place and then come back with 1-2 character kits and 1-2 unit kits. For the record, if I did rebase my Brayherds, I reckon I'd end up with something like this: Doombull w Great Axe General Beastlord w Great Axe Wargor BSB Great Bray Shaman Great Bray Shaman 30 Gors with Beastshields 10 Gors with Additional Hand Weapons 10 Gors with Additional Hand Weapons 10 Gors with Additional Hand Weapons 10 Ungor Raiders 10 Ungor Raiders 10 Ungors with Mauls and Halfshields 10 Ungors with Mauls and Halfshields 10 Bestigors Tuskgor Chariot Tuskgor Chariot 3 Bullgors with Greataxes 3 Bullgors with Greataxes Wildstalker Brayherd The only models I don't actually own from the above is a Doomnull and I only have 5 Bullgors (Since I was converted one into Taurax, the Brass Bull which I suppose I could run as a Doombull). I'd also probably need to build up a few Gor for command models for the Additional Hand Weapons, as they're currently one unit. Pretty cool how an 8th edition army translate pretty cleanly to Age of Sigmar in this case. 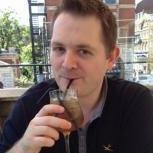 Stylus posted a blog entry in Monsters and Gribblies and Beasts, oh my! Last weekend, I took a selection of my chaos forces for a round-robin tournament of games. Here's an overview, the links go to the full reports. Half the players were new to Age of Sigmar, so to keep it fun, the 1000pt lists were written as deliberately soft (although tell that to the guy who brought the Mourngul! ), and we skipped Allegiance traits and extra abilities/items. I took a selection of what I fancied: Tzaangor for punch, Chaos Warriors for securing objectives, Gor to overwhelm objectives, and a Chimera to spit out mortal wounds. Ogroid Thaumaturge - General Beastlord - Man-render Great Axe 20 x Gors - Two Gor-Blades 10 x Tzaangors - Pair of Savage Blades (4), Savage Greatblade (3), Savage Blade & Arcanite Shield (3) 10 x Chaos Warriors - Hand Weapon & Shield - Mark of Chaos: Tzeentch Behemoths Chimera Game 1: Take And Hold vs Nurgle Rotbringers http://woffboot.blogspot.co.uk/2017/05/woffboot-xi-disciples-of-tzeentch-vs.html In the first battle, I take on Tzeentch's arch-enemy, Nurgle: Bolad Rotspawned, two units of Putrid Blightkings and a Chaos Lord on Manticore who just loves chomping on big monsters like the Chimera. Game 2: Blood And Glory vs Stormcast Eternals http://woffboot.blogspot.co.uk/2017/05/woffboot-xi-disciples-of-tzeentch-vs_25.html Half the points in this army were spend on Dracoth cavalry - Fulminators and Concussors (the models used were Dragon Ogres - there was a lightning theme going on) and they tended to bulldoze through anything they hit. I had to play this one for the objectives, because I wasn't optimistic about a straight fight. Game 3: Escalation vs Ironjawz http://woffboot.blogspot.co.uk/2017/05/woffboot-xi-disciples-of-tzeentch-vs_26.html I'm playing my own Ironjawz army in this one - I'd just finished painting one and I loaned it out for the weekend (it did pretty well - maybe I picked the wrong army). 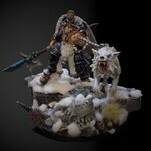 Ironjawz seem to do well in Escalation since their battleline units, which come on first, are a lot better than mine. Game 4: Border War vs Stormcast Eternals http://woffboot.blogspot.co.uk/2017/05/woffboot-xi-disciples-of-tzeentch-vs_27.html More Stormcast! This army was essentially the Starter Box one (so at least there was only one Dracoth to face. I had the advantage of massively outnumbering the golden guys, so I could flood all of the objectives. Game 5: Gifts From The Heavens vs Nighthaunt http://woffboot.blogspot.co.uk/2017/05/woffboot-xi-disciples-of-tzeentch-vs_28.html Yikes. An entire army of Nighthaunt, let by the 'orrible Mourngul. In model terms, they are only a third the side of my army, so if I can just knock off a couple, I should make it difficult for them to hold objectives (although I have no idea how to stop that damn Mourngul)... All in all, a fun weekend. Some wins, some loses, and a good run-out for my troops. The Ogroid impressed me particularly, and I'd love to try a 20-strong Tzaangor unit. Ambush themed Chaos army in need of input! Hey dudes, Raising some cash for some new purchases. I'm finally willing to part with my classic 90s Bloodletters and the most recent Khorngor models. Details below. All prices are in Aussie dollars, shipping at buyers expense but am open to negotiating, happy to combine shipping if you grab both units. Models have some paint but the old metal is super easy to strip (i'd be happy to do this for the buyer if it's the only thing holding you back). All models on squares, can cut them off if you want. 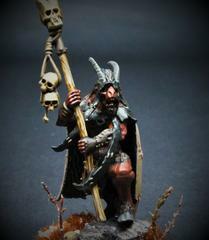 Bloodletters: 35 models in total with complete command group. All models are metal. Theres also a bag of incomplete models and bits, so you might get a few more out of that. AU$200 Khorngors: 24 models in total with proper standard and musician, champion is converted from the old chariot crewman. $AU200 Trades: I'm only interested in Wrathmongers/Skullreapers and Chaos Chosen models. Would accept 10 Chosen models with command or 10 Wrathmongers/Skullreapers as a trade for each unit. Thanks for checking this out guys. I played a battle tonight using my Narrative Battleplan "Stuff of Legends". We rolled up about the most boring thing we could have, so I'll have to do a little work to make sure that things aren't boring, but even so it was a pretty fun battle. On the Victory Conditions table, we rolled up "Monument" for the Objective, which is what made it a bit dull. I had Flesh-eater Courts and got "Command" for my motivation while my brother brought Beastmen and appropriately got "Ruin". We brough artefacts and since I picked the Cursed Book, I decided that my heroes had read the book and were trying to use the Dark Magic TM of Dreadstone Blight to reanimate Uncle Ivan's deceased wife, the Ghoul Queen. We also picked the Ashlands Time of War from Godbeasts. Fortunately, my local game store has a nice selection of battlemats, so we were fighting over LAVA! I was glad we chose a large central objective because it helped break up the big battle in the middle that would have otherwise ensued. We ended up having a Bullgor fight on one side of the Dreadstone Blight, and a Bestigor fight on the other side. Uncle Ivan is on the Terrorgeist, commanding the Dreadstone Blight. Rurkar Festigor (Beastlord) is on the other side smashing the building to pieces. The Bestigors were determined to bring the tower down. Sadly, in the end, the Brayherds were completely tabled. We ended with 5 Victory Dice for the Flesh-eater Courts and 4 for the Brayherds. After rolling, Uncle Ivan managed to resurrect his dead wife, for whom I will now have to find a suitable model. The Bestigors after they met Crypt Horrors (also got Death Shrieked by a Terrorgeist). I look forward to trying out the battleplan again. The most cinematic moment the battleplan created was on the first turn when I offered my brother a Victory Dice to sacrifice Skreet the Warlock Engineer to the Pyroclasm (it's an Ashstorm thing). The reason Skreet is not pictured is because it killed him poor little rat. However, I think that the low number of available Victory Dice applied downward pressure on our level of interest in awarding them to eachother.